Technical challenge. 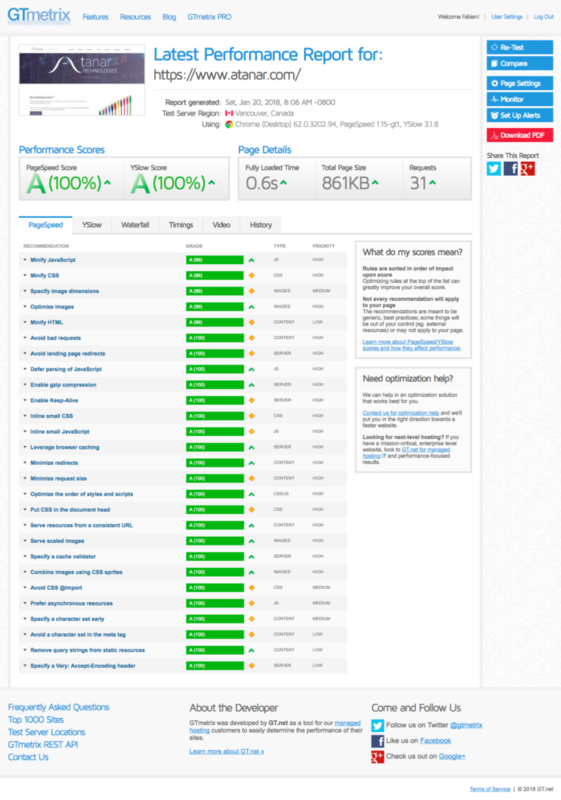 If you wanted to have the perfect score on all these page speed tests… How would you do it? I have been working recently for Atanar Technologies on renewing their website and graphical identity. One of the challenge they gave me was to have the perfect score on GTMetrix page speed. For the CDN provider hosting the European Space agency, among others, it seems a fair requirement to show off their skills. So, how did we do it? Classic blogging platforms (wordpress, joomla) and other CMS are out of the picture, the site has to be static. After looking around, I went for Jekyll (Hugo was also on the top of the list) for the reasons that I like Ruby a lot, it generates a static site and that the pool of devs for maintenance (at the time of creating) is quite big, if needed. Mission accomplished: PageSpeed Score 100%, YSlow Score 100%. Graphic design has been made by Catarina Vitorino, minimalist designer.